THQ Confirms "Reverse Stock Split"
THQ is going ahead with its plan to dodge a NASDAQ delisting. 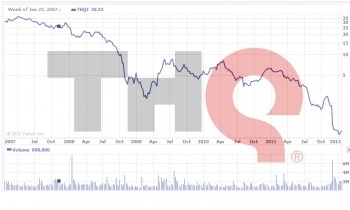 It's been almost six months since THQ was warned that it would be deslited from the NASDAQ stock exchange if it didn't get its share price up over $1, yet it continues to languish well below that mark - a little under 60 cents at last check. With no sign of the stock catching fire any time soon, THQ unveiled "Plan B" at the end of May: a "reverse stock split" that would, pending shareholder approval, reduce the number of shares in the company but increase their individual value and thus fulfill the NASDAQ's requirements. The reverse stock split was given the green light at a special meeting of stockholders on June 29, and today THQ announced that it is going ahead with the plan at a 1-for-10 ratio, meaning that as of July 9, every ten shares of issued and outstanding common stock in the company will become one. The actual number of shares in the company will go from approximately 68.5 million to 6.9 million, while the per-share value, based on the current price, will go to approximately $5.90. The reverse split will put THQ's share price well above the NASDAQ's requirement, but there's no guarantee it will stay there. While opting for the 1:10 ratio will push the price well above the $1 mark (less drastic 1:3 and 1:5 ratios were also considered), the company warned that "there can be no assurance that the reverse stock split will have the desired effect of raising the closing bid price of THQ's common stock to above $1.00 per share" to meet the NASDAQ's minimum. There's some rather serious risk in the maneuver too; the stock is in the tank now, but by reducing the number of shares to force the price up, the company exposes its shareholders to even greater losses should the price slide back to anywhere near where it currently stands. Ten 60 cent stocks may not be worth much, but they're worth a lot more than one 60 cent stock.